Winter is here, and for most states, so are the cold temperatures. Pretty soon (if you haven’t already), you’ll be receiving those familiar emails from your electric and gas companies offering advice on how you can save an extra dollar during the winter season. Just like during the summer months, there are steps you can take to weatherize your home to ensure you conserve energy and avoid an astronomical electric and/or gas bill(s). Add extra insulation here, seal windows there, throw on an extra blanket (or two). And just like we work to conserve energy and save money in our homes, we can also repurpose these methods in the workplace. Turn off electronics when not in use. This is one of the first things that come to mind when looking for ways to conserve energy. The logic is pretty simple here: If you’re not using it, you don’t need the energy; so, turn it off. Unplug appliances in the break room and/or at your desk. Shut down computers instead of just putting them to sleep or allowing them to run through the night. Turn off all lights if you’re the last person to leave the office or make sure lights are turned off when not being used. Like in your home you’ll be surprised at how far simply unplugging-when-not-in-use can go. Replace incandescent light bulbs with energy efficient bulbs. Again, another common practice in the home that can be transferred to the office. According to the Environmental Protection Agency, humans spend 90 percent of our time indoors. This means at some point in our day we’ll be using light bulbs. 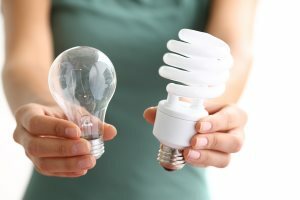 On average, compact fluorescent light bulbs are 75 percent more efficient than incandescent bulbs and LED bulbs are 90 percent more efficient than incandescent bulbs. This can mean the difference between an average bill of $264/month and $24-66/month. Now that is a big difference. Remove unnecessary lights. Do you have any rooms or areas in your home that have unnecessary lights, whether it be too many bulbs above the bathroom mirror or numerous light fixtures in one room? Most company buildings do too. Examine the lighting structure in your workplace to determine if there are lights that you can do without. Utilize sunlight when possible. Most people know that the best light is sunlight. Nowadays many buildings are built using daylighting, or the practice of placing windows or structures in areas where natural sunlight can be used. If you’re in an office with a window large enough to provide natural sunlight, avoid using regular lights during the day. You can also move meeting spaces to areas that offer natural sunlight. Program machines to turn off at certain time of day. Again, you don’t want to leave appliances running all night. Program your fax and copy machines to power down at certain times of each day to conserve energy over night. Reduce faxes, copies and printing. Minimize the number of faxes you send, copies you make and how much you print. Having these machines constantly running takes up a great deal of energy. Look for ways to go paperless by sending an email instead of a fax, printing on both sides of the paper and limiting the amount copies per department or person. This practice also helps your office stay green by reducing the amount of paper used. Make sure vents aren’t obstructed. Ensure each vent in the building is fully open with nothing blocking the air ventilation. If vents are obstructed, heat will be trapped making certain rooms colder. This can prompt your company to increase the thermostat to a higher temperature, thus increasing your bill. Turn off elevators and escalators on weekends. Elevators and escalators use electric just like everything else. Turn these off during the evenings, one day out of each week e.g. Fridays, and/or during the weekends to save energy.